That commitment is demonstrated every day in every district facility, by teachers, students and staff. 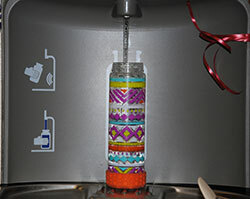 refillable water stations was proposed to Board of Education members at a meeting in February by members of the Lego League – Team Lego Matrix – in an effort to reduce the amount of plastic bottles used throughout the school day. Eighth-grader Nick Harris explains that the team came up with the idea as part of their Lego League project, and thought it was so good they made a proposal to the Board of Education to install refillable stations in all the schools. The project has been very well-received at the middle school and students are making good use of it. 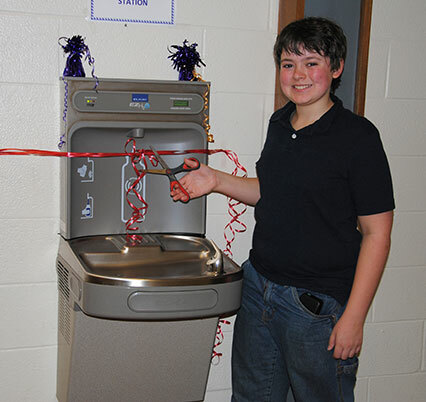 More refilling stations are on order, and the goal is to have at least one at every school by September 2016. At Sanfordville Elementary School, Instructional Technology teacher Diane Connolly advises the new “Future Cities Club,” which has designed a recycling logo to be put on water bottles throughout the district, to help encourage more recycling. At the high school, students have been collaborating with the Food Service Department on a similar project. In the near future, the 9th grade class and members of the National Honor Society will put recycling stickers on water bottles for sale, reminding their peers to recycle. Additionally, the high school administration is planning an upcoming locker clean-out day, where all students will be given time to empty their lockers. Student volunteers will be traveling the hallways with waste and recycling containers, encouraging and instructing their peers to separate recycling from garbage, giving everyone an opportunity to start fresh with renewed recycling efforts building-wide. With the help of Sustainable Warwick, each district building has created a “Green Team” that consists of administrators, teachers and students. The Green Teams are building their knowledge base on sustainability and learning to recognize topics already in their curriculums that demonstrate sustainability. At Park Avenue Elementary School, the Green Team is working with Sustainable Warwick to teach the students how to reduce waste. Members of Sustainable Warwick have volunteered to take the students on a “field trip” to the building’s dumpsters, to show them just how much waste they produce as a school building on a regular basis. From there, the students will measure and record the amount of waste vs. the amount of recyclable material they produce in their own classrooms. 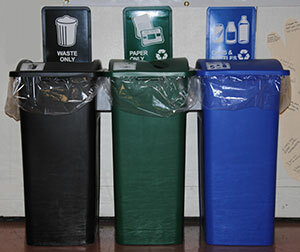 The mission is to have students understand their connection to trash and waste that is produced on a daily basis, and what they can do to reduce it. The hope is that through their changed behavior, the Park Avenue community will see a marked change in the amount of waste they produce, and be encouraged to continue living greener lives outside of school as well. Members of Sustainable Warwick have been instrumental in the effort to become a greener school district. They have been helping to implement the EPA grant and planning for programs that promote sustainability in a positive way. They have acted as liaisons with CELF (the Children’s Environmental Literacy Foundation) – environmental curriculum experts – to ensure that local resources – those things that are unique about our Warwick community and environment – are integrated into curriculum district-wide. In the near future, members of Sustainable Warwick will work with the school community on new and innovative ways to engage students and teachers more, and to become a highly organized and successful team on concepts and practices of sustainability in our schools, in our community and in our daily lives. “There have been many exciting changes and improvements to the curriculum at all grade levels. The enthusiasm of our Green Team members and the positive physical changes taking place in our buildings show great progress in such a short amount of time,” said Dr. Leach.